Summer is heating up early for The Knack, and there’s so much happening that even they need a scorecard. 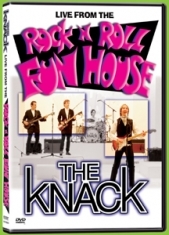 The band, which boasts three of its four original members from its late ’70s inception, has teamed up with Image Entertainment, long recognized as the market leader in licensing, distribution and production of music video long forms and DVDs, to release The Knack: Live from the Rock n’ Roll Fun House on DVD, VHS and CD, on April 23. To celebrate the live album, the tour and the classic reissues, satellite programmer DirecTV will broadcast the “Fun House” concert as a free view event every weekend in May. On top of all this, the classic Knack hit “Good Girls Don’t” can be heard in Buena Vista Pictures college comedy Sorority Boys out now through the summer. Fans will immediatley recognize this song as the follow up hit to the ever popular My Sharona, both released in 1979 to a pop hungry public who embraced both with open arms. The Knack: Live from the Rock n’ Roll Fun House, was recorded in front of a studio audience, as they say on TV, and, in fact, simulates a ’60s TV show in the spirit of Hulla Baloo, Shindig and Ed Sullivan with a host and The Knack as the musical guest. All formats feature the hits, as well as compelling new material that underscores the band’s staying power. Though The Knack’s original three members, Fieger, Berton Averre (lead guitar) and Prescott Niles (bass), will rock the “Fun House” with signature Knack tunes “My Sharona,” “Good Girls Don’t,” “Oh Tara,” and “Baby Talks Dirty,” plus many more, the revolving door behind the drum kit has captured yet another victim, this time, Holmes Jones, a.k.a. David Henderson. He took over the skins halfway through Normal as the Next Guy, kept the beat on Live from the Rock n’ Roll Fun House, and is already packing for the upcoming tour. “We’ve had five different drummers in 15 years, kind of like Spinal Tap,” Fieger jokes. “They keep exploding. As a result, there are only three official Knacks.